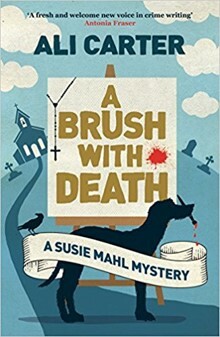 “Pet Detective” is the nickname Susie Mahl acquires partway through this contemporary mystery, and is also a good premise for a murder series. Susie is an artist with a talent for painting animals which pays for her taste in expensive underwear. She undertakes commissions to paint people’s pets, and soon her detective abilities are revealed. In “A Brush with Death” the setting is the homes of the landed gentry in Dorset, specifically the Earl and Countess of Greengrass. The Earl appears to be an affable, harmless old gent while his wife is a more imperious Grande Dame with a dismissive attitude to most of those around her. Were she to become the corpse there might be a full range of suspects, but it is the Earl who meets his end in the village churchyard (making the cast list of suspects somewhat thinner). The plot thickens however when the Earl’s will is read and his son and daughter-in-law are drawn into the drama. Susie meanwhile hunts down tenuous connections and potential holders of old grudges as well as those who might have gained from, or desired, the Earl’s death, but the range of suspects is rather unconvincing. It is difficult to find anyone for whom it would be worth murdering a man in his 80s - whose death by natural causes cannot be far off. Susie billets herself with the Greengrass family in an estate cottage in order to be on hand for all developments. Feeling the police are not sufficiently proactive she embarks on a ruthless campaign to get the handsome pathologist who has conducted the Earl’s post mortem on the case with her. Together they use forensic science as the means of identifying the murderer, and set about tracking him (or her), down. This is the first in a proposed series, though could do with more judicious editing as the book suffers from unnecessary passages, exposition that slows the pace of an otherwise elegant narrative.